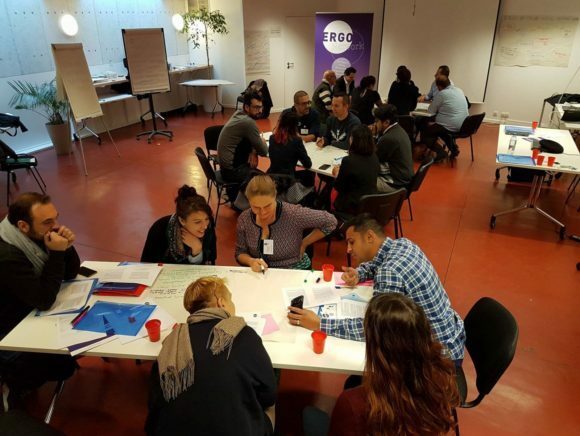 ERGO Network brought together people from over 20 organizations and young Roma activists for the Annual Members’ Platform that took place in Brussels on 28 November 2016. The meeting was opened by Ruus Dijksterhuis, Director of ERGO Network, who shared a short history of the work that was conducted by ERGO and opened a space for the members organizations to present their own work and share their motivation for taking part in the network and its activities. Then the ERGO members split into small groups to develop a common approach for fulfilling the ERGO Network Strategy. The group work was focused on the questions: What brings members together? What drives them in their work? How can the ERGO Network be strengthened? During the meeting ERGO was using methods of the participatory leadership methodology. The methods were introduced and facilitated by four young Roma activists who were trained in those methods during the ERGO Summer Academy. The members agreed that ERGO Network offers its members an effective platform for provision of information and exchange on relevant political and policy developments from the European perspective and from other countries, which can be used at local level. It is a platform for like-minded people. It serves as a source of motivation and inspiration for more effective grassroots work. ERGO Network for many members represents a strong organization based in Brussels that can bring the grassroots reality to the Brussels fora and advocate for Roma people. Moreover, the members agreed that ERGO needs to keep its focus on network development and engagement of members in the work of the others, because only by working together we can strengthen the voice of Roma.